Don’t be fooled; the evidence does not suggest that democracy is bad for growth. This post is about why Trump’s comparison of the US with China is not useful. More broadly I want to defend democracies against the mistaken argument that authoritarian countries perform better economically than democracies. Firstly, it is important to distinguish between two different forms of economic growth – growth at the technological frontier and catch up growth. 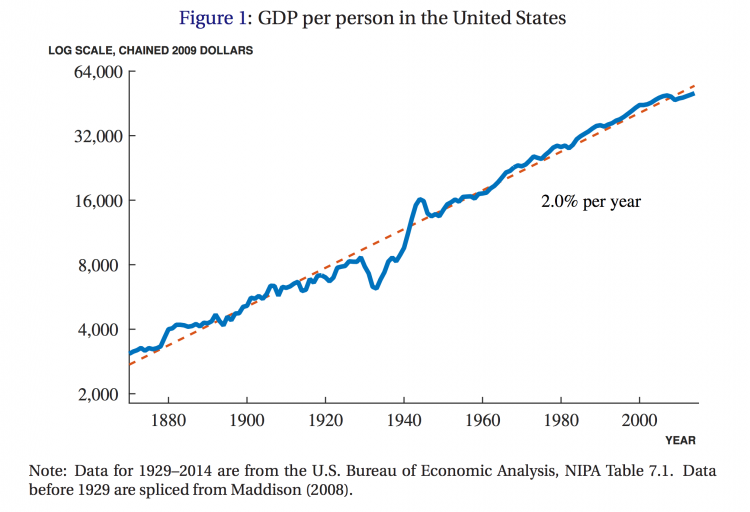 Secondly, it is important to distinguish between the level of prosperity (GDP per capita) and the growth of prosperity (growth of GDP per capita). If we don’t distinguish we get all confused about what political systems make possible or impossible for growth. Catch-up growth is different from that, it is all about adopting existing technology and making use of it at a large scale. Catch-up is hard enough – if we knew how to do it everywhere we would have ended extreme poverty long ago. But once a country starts to catch up it can improve living conditions very rapidly; growth can be much higher than 2% for extended periods. And from what we have seen over the last decades autocratic rule is not necessarily an impediment to catch-up growth for very poor countries. If we don’t distinguish between the two forms of growth we are in danger of comparing the fast growth in autocracies with the slow growth in democracies and take away that autocracies are better for growth. The key to understanding why China and others could grow so fast is not that they are autocratic but that they are very, very poor. China’s level of GDP per capita is only a quarter of the American GDP per capita. Fast catch-up growth can only happen in poor countries. What determines the “growth advantage” of autocracies is not that autocratic countries work better but that autocratic countries are poor. Catch up growth can only happen in poor countries and it is very misleading to do what Trump does and to compare a country on the technological frontier (the US) with a very poor country (China) that is catching up. This is a same confusion that leads people to believe the ‘old argument’ above. A fundamental problem in social science is that all good things come together. Developed countries are richer, healthier, happier, better educated, more democratic etc. The trouble for researchers – and ultimately policy makers – is then to find out what causes what. There is some research that suggests that democratic rule – ceteris paribus – is good for growth, but I would not think the evidence for this causal relationship is overwhelmingly clear. What is however clear is that there is no reason to believe that a rich country at the technological frontier would do better if it was autocratically ruled. This false idea comes from the confusion of catch-up growth with growth at the frontier. Don’t be fooled by China or Donald Trump, autocratic rule is not good for growth.